You don’t have to pay a heavy price for internet access. With a bit of searching and planning, you can reduce your internet cost to zero, or at least very close to zero. Almost all of these options will work to get you connected from your home or on the go. Just remember that flexibility is the key to no-cost Internet access. Start your search with this selection of 5 free internet connection options. The free plan (Basic 500) provides 500 MB of monthly data on their 4G network only; no access to their 3G or LTE networks. Access to the 4G network is provided via a hotspot/router provided by FreedomPop. You can access the Internet service wherever a FreedomPop cellular signal is available, and since the data network is supplied by Sprint, there's a good chance you can make a connection wherever you are. When you hit 500 MB, additional fees are automatically charged to your account at the current rate of $0.02 per MB. If you're going to routinely go over the 500 MB limit, one of FreedomPop's alternate plans, such as the 2 GB plan for $19.99, may be a better fit for your needs. This plan also provides access to all of the FreedomPop network types, including 3G, 4G, and the faster LTE. There's a one-time fee for the hotspot/router, starting as low as $49.99. That's actually a fair price for the hotspot hardware, but it's still an added cost when looking for a "free" Internet service. Mobile hotspots allow you to connect to wireless data networks and share your cellular connection with your laptop, desktop, or other computing devices. Mobile data plans aren't cheap, but surprisingly, there's at least one that is free. FreedomPop, for example,offers a number of internet access plans that make use of a mobile hotspot to connect to their cellular data network. Plans range from free to around $75.00 per month. All of the plans make use of FreedomPop's 4G/LTE network, and have various monthly data caps associated with them. FreedomPop also includes a free month of the 2 GB data plan, so be sure to change your data plan to the Basic 500 at the end of the first month if you're looking for truly free monthly Internet access. FreedomPop Basic 500 works well for those who just need to check their email or do a bit of basic web browsing. Speed is dependent on the quality of the connection, but if you're receiving a strong signal, you should be able to access the Internet with speeds up to 10 Mbps. Access is via a standard Wi-Fi connection; no special hardware or software is usually required. While connection speeds can vary, they're almost always as good as the average service plan speed offered by an ISP. That means connection speeds of 10 Mbps to 100 Mbps (and even higher on occasion) are possible. Even better, most of these ISP Wi-Fi hotspots don't impose data caps or count the amount of data used against your account's data cap, should you have one. Finding the ISP-provided Wi-Fi hotspots can be challenging. Although most service providers include some type of app or map showing locations, they tend to be out of date by a few months. The other issue, especially for those on the go, is that if you find yourself in a location not serviced by your ISP, you probably won't find any associated hotspots to use for free. If you already have an Internet service provider, chances are it offers access to company-owned or affiliated Wi-Fi hotspots around town and around the country. This type of Wi-Fi hotspot can be found not only at business and public locations, but, in some cases, entire communities or neighborhoods may be part of the hotspot. Using one of these hotspots is best for those traveling for work or pleasure. The free access is a much better deal than what some hotels charge, and the connection speed is usually much higher, so you can stream music and movies, play games, browse the web, or just check your email. They're free. That alone is appealing, but most cities are targeting common areas - popular parks, public attractions, and transportation centers – essentially, the places where visitors and residents are spending their time in town, which is where you're likely to be, especially when on a trip or sightseeing. Limited bandwidth, limited locations, and the slow rollout of new municipal hotspots. Many cities and communities are building publicly available Wi-Fi networks that offer free access to both residents and visitors. 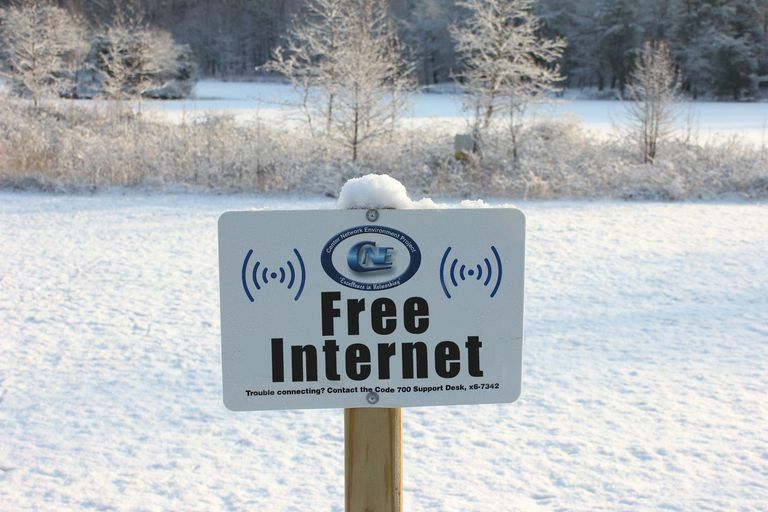 Many communities offer free outdoor public Wi-Fi similar to the City of Boston's Wicked Free Wi-Fi. This type of service is designed to provide free Internet access in public locations around the town. All that's needed is a device, including smartphones, tablets, and laptops, that has built-in Wi-Fi support. Most municipality-supplied Wi-Fi has limited hotspot locations as well as limited bandwidth, which could impact how you use the internet. But for basic access and routine usage, they tend to work well. Find out if your city has free municipal Wi-Fi. How easy it is to find these types of hotspots. Once you're connected, don’t forget it's expected that you'll take part in the business service provided: have some coffee, get a bite to eat, or play golf. Did we mention our local golf course has Wi-Fi? Yours probably does, too. Some services have difficult login procedures, others haven't seen much in the way of maintenance, producing dead spots in coverage or offering no type of support should you be unable to connect. Many businesses that serve the public offer access to the internet, usually over a local Wi-Fi network. McDonald's, Starbucks, and Walmart are examples of companies that provide free Wi-Fi. And it's not just restaurants and grocery stores offering the service; you'll find that most hotels, medical offices, hospitals, campgrounds, even roadside rest stops offer free Wi-Fi. The quality of the service varies a great deal; this includes speed of the service and bandwidth, as well as data caps or time limits that may be in place. Connecting to these services may be as easy as opening your network settings and selecting the free Wi-Fi network, or it may require you to set up an account or make use of a guest login system. In most cases, the process is automated; once you select the Wi-Fi service in the network settings, a webpage will open with instructions on how to complete the connection. Once connected, you're free to wander about the web. This type of Internet connection is a good way to catch up on daily needs. Check email, find out what's been going on in the world, maybe even relax a bit and watch a streaming show as you wait for a doctor who is running late. If you need a place to do some research or just relax, it's hard to beat a well-equipped public library. It's not the best spot for conducting or attending a meeting over the internet (video calls, for example) since quiet is the key in any library. Libraries are the last entry, not because they come in last, but because they offer much more than just free internet connections. They also can provide you with a computer to use and a very comfy chair to sit in. Besides offering computers, libraries generally offer free Wi-Fi connectivity for all of their visitors. But a library's Internet services may not stop with each visit to the library. Some, like the New York Public Library, will lend you a mobile hotspot to use at home to connect to the city's free Wi-Fi network. Research, homework, relaxing; public libraries tend to have well-designed Wi-Fi systems that work well for just about anything you need to do on the Internet.